Official Member of the Kaskaid Event Group Family. Sushi, sandwich platters, box lunches, hot buffets, desserts & lunches all delivered fresh! The most award-winning caterer in Minnesota. Located in Downtown Minneapolis, Muse is perfect for groups of 50 - 1,200. 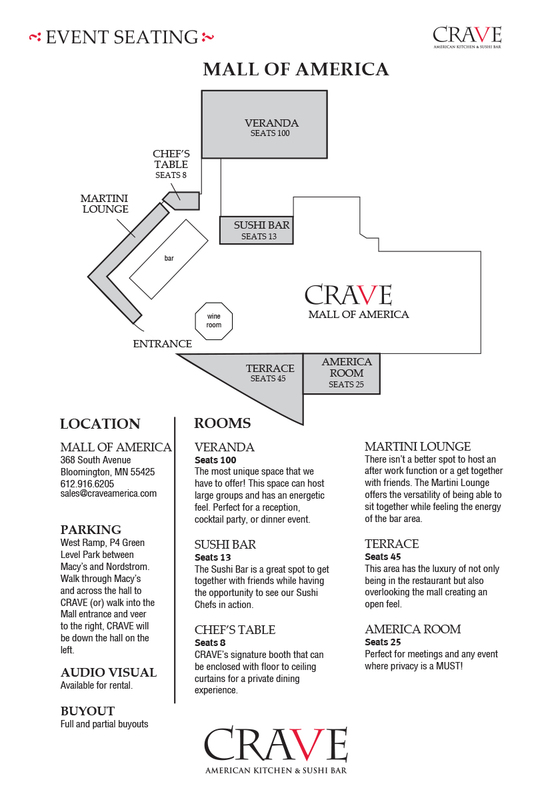 CRAVE at the Mall of America offers a variety of beautiful spaces to host your next event. Because of our close proximity to the airport, we host many out of state groups looking for a fun place to dine or plan a group meeting. From menu design to decor, our experienced and dedicated staff will work with you every step of the way to execute the perfect event. Whether you’re planning a birthday, wedding, social gathering, or corporate event, our goal is to ensure your event is truly unforgettable! Book CRAVE – Mall of America For Your Event Today! Ready to take the next step? Contact us by filling out the form below and one of our Event Experts will be in touch!